B2Digital, Inc. BTDG - One of the stocks that we were looking at from yesterday morning‘s extended watchlist was BTDG. This super-subpenny play made its move right from the opening bell, and by the time the first hour of trading had elapsed, the stock had recorded a double-bag move to the upside. 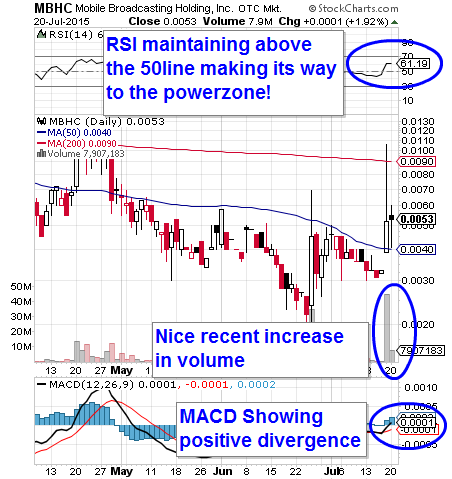 BTDG traded in a range from its low of .0004, and hit .0008- a perfectly symmetrical 100% rip. The stock closed at its dily mid-point of .0006, and with the kind of volatile price action we’ve observed, we’ll be certain to keep an eye peeled in sessions to come. Novus Acquisition & Development Corp. NDEV – The other notable mention from yesterday’s report was NDEV. We noticed this one had just perked up after a sustained period of lethargic trading the day prior, and the trend continued. The stock traded in a solid range from .30-.442, an intraday push of 47%, and perhaps most notably, closed with strength at .43 after having traded roughly two-and-a-half times its 30-day average volume. That’s sufficient to warrant further observation, thus NDEV will remain an item of interest for us. We’re going to add DTEA to the radar this morning. After a substantial gap-down and continued backslide on Friday, the stock gave a hint of a bottom-bounce to kick off the week yesterday along with a major influx of volume. As you can see on the included snapshot, the stock is egregiously oversold and could be preparing for a more significant rebound, so we’ll want to be on the lookout for that. Our first order of business today is to congratulate any of our readers who were able to turn our premarket alert of LXRX into hefty intraday gains. We were given ample opportunity to do so, as a hugely significant PR left the stock positively charged for most of the session. A momentous intraday run began from an early low of 10.83 and topped out at an HOD of 13.80. That translates to a 27% jump, which is a very impressive single-session performance for a $10 stock. LXRX held the majority of its daily advance, which occurred on well over 30-times the 3-month average volume. That sets the stock up with plenty of momentum, and signals us to keep an eye out in coming sessions for a continuation of such. In the event that occurs, as far as options are concerned, we’d roll our strike price up to the Weekly $12.50 Calls, which already made a heck of a move yesterday from .45-2.00. 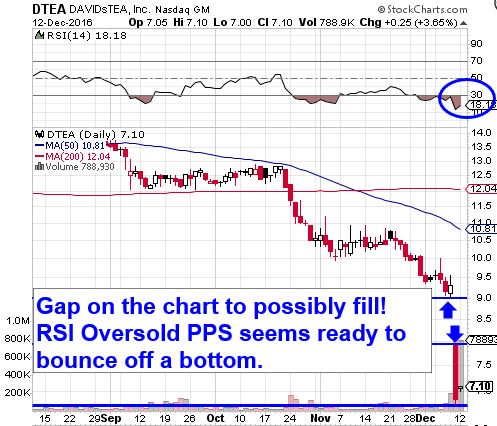 We also want to give a quick update on HTCH, which we entered into the conversation via Friday’s premarket report. We witnessed the beginning of its run that day with a low of 1.60, and subsequent 22% pop to 1.95. Yesterday, the stock set a new high of 2.25, which marked a two-day increase of 41% In order for us to remain interested in this play. we’ll need to see it continue to record higher lows. We began taking a look at MBHC yesterday, mostly focusing upon the strong additions to management, and the extreme promise pertaining to the company’s news of a global deal signed with Twitter. We did however, publish a video highlighting some of the key points on the chart, and that’s what we’re going to focus on to start things off today. The stock would make a handful of intraday moves on almost twice the monthly average volume. Early on we saw a run from .0042-.0057 (+36%), followed by two separate subsequent swings from .0041-.0053 (+29%). Most importantly the stock recorded a higher low, holding support above 50DMA of .004 as we’d hoped for, and we want to continue to see it maintained above that level. Moving forward, we’ll be looking out for a breach of the resistance that cropped up at .006 . 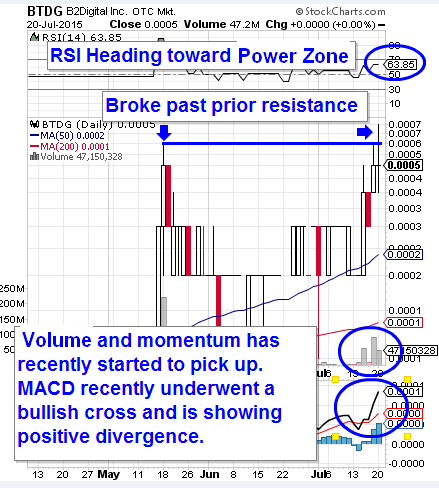 BTDG is a momentum-play that we’re going to be monitoring as we head into mid-week, and we’ve gone ahead and pointed out the reasoning behind this on the following chart snapshot. Yesterday brought a break of a key resistance point and with a number of other bullish indicators are leading us to give BTDG part of our attention.